Easily DIY themes to beautify home screen, 1 minute, 2 steps. It's Cobo Launcher, the easiest Android beautifier. ☆ Easier than ever before. Only two steps to beautify your home screen: choose wallpaper, choose visual collocation effects, work to be done within 1 minute. You no longer have to waste a lot of time by using those normal launcher to pick the wallpaper step by step, and select those widgets and icon packs to set up the layout. ☆ Not only fast, and also very considerate. When you choose a wallpaper, Cobo Launcher will automatically combine the wallpaper, widgets and icon packs, then show all the match results, and classify all of them in accordance with the styles, such as the Best, Simple, Black and White, Solid Color, Colors, Cool, Art, etc.. You can directly choose a visual effect from these categories, it is very convenient. ☆ To make your DIY themes more easy, Cobo Launcher has abundant cool themes, beautiful wallpapers, cool widgets, personalized icon packs. It is all-embracing! Fully satisfy your constant pursuit of newer and more cool themes to beautify your home screen everyday. ☆ We will released daily cool theme and exquisite wallpapers, which are all carefully selected. You can also visit our Facebook page to tell us about your favorite themes, widgets, wallpapers and icon packs, as well as likely to be a surprise for you. ☆ When you complete DIY themes, you can share it with your friends, and they just need to install Cobo Launcher too, and apply it. Your friends do not have to search themes, wallpapers, widgets, icon packs in Google Play again, therefore they can easily beautify their android phone. Yes, you saved them. ☆ We will pick up beautiful themes from the Cobo user shared themes, and recommend to millions of Cobo users, it is really exciting. Therefore, in the creation of your DIY themes, please enjoy it and happy to share it. ☆ Cool Lock Screen: The lock screen themes perfectly match with the home screen, without having to set up lock screen again. Of course, Cobo Lock Screen supports slide to unlock, password unlock and pattern to unlock etc..
☆ Charging Screen: Cobo Launcher has unique Charging Screen to offer you a different charging experience. When you plugged into the phone, Cobo Lock Screen will switch to Charging Screen automatically. On Charging Screen, the cool charging effect will notify you the charging progress. The Professional three-stage charge mode in Cobo Launcher's Charging Screen makes battery fuller and more permanent standby, and it also can extend the battery life effectively. ☆ App Lock: Do not like someone feel free to open your private apps? 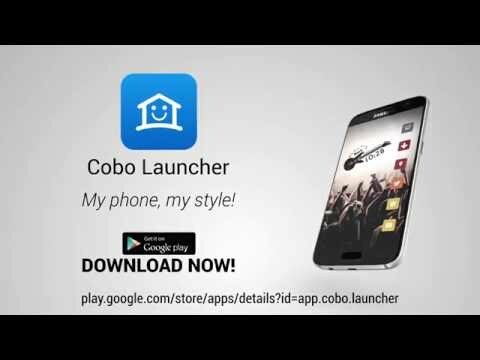 Please use App Lock in Cobo Launcher. Just set up a separate password for your private apps, such as Whatsapp and Facebook, the App Lock will protect them immediately. No one can find out your secrets. ☆ Hide APP: Do not want someone to view your important apps? No problem, you can hide them in drawer, set up a separate password that only you know where they are. ☆ Ram Boost: Rapidly cleanup Apps running in the background, freeing up memory and make your phone more smoothly. ☆ Quickly Search: Slide down on the screen to search your local apps and any web content. ☆ Floating Toolkit: Check 7-day weather forecast directly, add commonly used apps. You can also customize the Toolkit icon styles, make your home screen becomes impeccable in every detail. Your feedback will help us to develop a better Cobo Launcher.